"Imagine yourself as a race horse and choose your parasite medications and dentist wisely." BREAST MERIDIAN CONNECTED TO TEETH #2, #3, #14, #15,# 20,# 21,# 28, #29. While breast cancer patients are faced with making many difficult choices about their treatment strategies, dental work is arguably the greatest challenge. TO HELP YOU WITH YOUR DENTAL ISSUES, WE URGE YOU TO SEE A BIOLOGICAL DENTIST FOR AN EVALUATION OF YOUR TEETH. "A survey conducted at my clinic found that, on admission, ninety-eight percent of the adult cancer patients had between two and ten dead teeth, each one a dangerous toxin producing 'factory'." "Chronic inflammation has also been associated with several systemic diseases, like cancer. The literature demonstrates that either inflammatory mediators produced during periodontitis development could mediate carcinogenesis or periodontal bacteria can exert its effect directly in transforming cells. Interestingly, several oral bacteria, also found in high loads in the periodontal pocket, have been shown to activate inflammatory pathways associated with several stages of cellular transformation ..... Among them, these bacteria can induce NF-κB-mediated responses, promote cell survival, activate oncogenic pathways, reduce proapoptotic proteins expression, increase cell migration and invasion, increase the expression of EMT-associated proteins, enhance metastasis, etc." ​ In addition to mercury, amalgams contain a mixture of many other dangerous metals, and one independent researcher stated that 50% of amalgams may even be radioactive. WHERE IS WISDOM IN USING METALLOESTROGENS FOR METALLIC FOUNDATION FOR NANOPARTICLE PRODUCTION IN CONSUMER PRODUCTS? In his 2015 review study, David Wallace "focused on exposure to highly toxic metals, ('metalloestrogens' or 'endoctine disruptors') that are used as the metallic foundation for nanoparticle production and are found in a variety of consumer products, such as cosmetics, household items, and processed foods, etc." Background: ""Metalloestrogens are a class of metals shown to exert estrogenic effects through alterations of gene expression and/or modifying the activity of estrogenic receptors." These metalloestrogens "will elicit estrogenic effects and potentially change the breast anatomy. Alterations in breast anatomy correlate with increased susceptibility to the development of cancer". Note that cadmium has been shown to alter estrogenic activity in breast cancer cells (hormone positive), "leading to an increased proliferation of these tumor cells lines". But estrogen does not even have to be present to have an effect. (EDITORS' NOTE: SEE BELOW FOR THE METALLOESTROGEN, CADMIUM, FOUND IN DENTAL AMALGAMS AND BREAST BIOPSIES. Note that cadmium is in the air - "ambient, occupation, and cigarette smoke", has a half-life of 10-30 years, and can bioaccumulate. While phosphate fertilizers and auto exhaust comprise over 50% of exposure to cadmium, cadmium may even be in the gutta percha filling in root canals. Cadmium's Estrogenic Effects: Since estrogen does not have to be present, cadmium can even have an effect on post-menopausal women. "The actions of cadmium have provided the most compelling evidence of a correlation with breast cancer proliferation. Comparing the affinities of estrogen and cadmium for the estrogen receptor (ERa), both compounds exhibit similar affinities, yet defining cadmium action at the ERa binding ... has yet to be determined. The prevailing hypothesis is that ERa is sequestered in the inactive form - low estrogen or no estrogen. Once activated, the receptor undergoes a conformational change and enters the active state. Increasing the number of active ERa receptors will increase estrogen responsiveness. Cadmium inhibits the action of estrogen to increase the number of active ERa, suggesting that cadmium interferes with estrogen binding to the recognition site on the ERa receptor." CADMIUM, ARSENITE, SELENITE MIMIC ESTRADIOL IN BREAST CANCER CELLS HOW ABOUT COPPER, COBALT, NICKEL, LEAD, MERCURY, TIN, CHROMIUM, VANADATE IN BREAST CANCER CELLS? "We have shown that, similar to estradiol, metalloestrogens, (such as copper, cobalt, nickel, lead, mercury, tin, and chromium), induce the growth and expression of estrogen-regulated genes in breast cancer cells." Martin MB et al., 2003. The Martin MB et al. Georgetown University team has previously shown that cadmium, arsenite, and selenite mimic estradiol in breast cancer cells by activating the estrogen receptor. How about other metals? And how do they mimic estrogen? "The present study demonstrates that the divalent metal chlorides of copper, cobalt, nickel, lead, mercury, tin, and chromium, as well as the metal anion vanadate have a significant effect on estrogen receptor expression and activity. Similar to estradiol, these metals induce the growth of breast cancer cells, decrease the steady state amounts of ER protein and mRNA, induce the two estrogen-regulated genes, progesterone receptor and pS2, and activate the estrogen receptor in transient transfection experiments." * THEY DID HAVE "DENTAL RESTORATIONS, AMALGAMS, GOLD BRIDGES OR RETAINERS". In the Ionescu JG et al. 2006 study, the researchers explored the accumulation of heavy metals in breast cancer biopsies. The researchers noted that, 'High levels of transition metals such as iron, nickel, chromium, copper, and lead are closely related to free radical generation, lipid peroxidation, formation of DNA strand breaks, and tumor growth in cellular systems." Are these heavy metals present in the biopsies of breast cancer tissue as opposed to healthy tissue? In 20 breast cancer biopsies, "A highly significant accumulation of iron, nickel, chromium, zinc, cadmium, mercury, and lead was found in the cancer samples when compared to the control group. Copper and silver showed no significant differences to the control group, whereas tin, gold, and palladium were not detectable in any biopsies." In 2007, the Ionescu team further concluded that these accumulated metals in breast cancer biopsies may be related to malignant growth, and "explain the anti-tumoral effects of current therapies with high doses of vitamin C or substituted phenols, respectively." Dr. Ionescu commented on considering a new therapy with prooxidant vitamin C or phenolic compounds. "We therefore suggest that future utilization of high dose vitamin C with prooxidant character and / or combinations of substituted phenolic compounds devoid of side-effects should be seriously considered in the treatment of different malignancies. Both vitamin C and the phenolic compounds are taking advantage of the diminished capability of tumor cells to handle free radicals. Whereas free radicals are quickly scavenged in normoxic (healthy) tissues, hypoxic tumor cells are expressing low levels of ROS protective enzymes, such as superoxide dismutase, catalase, and GSH-peroxidase. Therefore, the tumor cells are much more vulnerable to free radical attack than normal cells. .... The autoxidation of vitamin C and phenolic compounds in the presence of heavy metals strongly increase superoxide and H2O2 generation at the tumor site, resulting in a fast depletion of the malignant cell reducing equivalents with oxidosis shift and apoptosis induction." had a root canal on the meridian of the primary tumor, and 30% had an infection in a crown on the meridian of the primary tumor." Jerry Tennant, MD, 2015. "During a root canal, the infected or inflamed pulp is removed, cleaned out, and a material, such as gutta percha, is inserted, and a crown or a filling encapsulates it. ​ Robert Kulacz, DDS, and Thomas Levy, MD, PHD, 2014. WHY CAN ROOT CANALS STILL GET INFECTED? ROLE OF IMMUNE SYSTEM. HUMAN EXTRACTED ROOT CANALS IMPLANTED IN RABBIT "TYPICALLY DEVELOPED THE SAME DISEASES THAT PLAGUED THE HUMAN FROM WHOM THE TEETH HAD BEEN EXTRACTED". "In one of his studies, Dr. Weston Price transferred diseases harbored by humans into rabbits, by implanting fragments of teeth from root-canals. He found that root canal fragments transplanted from a person, who had suffered a heart attack, when implanted into a rabbit, could cause a heart attack in the rabbit within only a few short weeks. The heart attack study was conducted with 100% effectiveness, while other diseases were more than 80% transferable by following this same method." "My dental assistant once described an extracted root canal-treated tooth as smelling like a dead mouse that had been decomposing for a while." Robert Kulacz and Thomas Levy, MD, JD, 2014. "HOTBEDS OF PATHOGENS AND TOXINS"
​"Root canals pose problems, as these treated teeth have a propensity to 'perpetually spew' bacteria." Robert Kulacz, DDS and Thomas Levy, MD,JD, 2014. Testing root canal toxins: Kulacz and Levy wrote, "How can we objectively measure the degree of toxicity in root canal-treated teeth? We know that the root canal procedure can not remove all the bacteria with a tooth and that over time additional bacteria will enter the mouth. ... Studies have shown that bacteria do come out of the root canal-treated tooth into the surrounding periodontal tissues. But more importantly, it is the small molecular weight exotoxins like hydrogen sulfide and methyl thiol that readily migrate out of the root canal-treated tooth." "Even a tiny population of bacteria or fungi that survives in a missed canal or somewhere in the miles of dentinal tubules can multiple into a large colony." And this bacteria is insulated - "disconnected" from the immune system's surveillance, so the bacteria can thrive. "Thus, removing the pain-sensing nerves from a tooth and blocking all access to the infection-fighting system does not 'cure' the tooth." DO ASYMPTOMATIC ROOT CANALS' BACTERIA INHIBIT ENZYMES RELATED TO ATP PRODUCTION? The results of enzymatic inhibition of one root canal treated tooth. Yes ..... In a preliminary 2012 study by Stuart Nunnally, DDS. Against a background of perceived toxicity from root canal treated teeth, Stuart Nunnally, DDS., sought to determine if asymptomatic root canals as confirmed on x-rays, would harbor ATP enzyme-inhibiting bacteria. To this end, this researcher had 25 seemingly healthy root canal teeth that had been extracted from his patients' mouths due to concerns about their health, tested. The extracted teeth were placed in sterile bottles. "The individual root fragments were carefully selected to minimize the impact of contamination or leaching from the restorativ materials. ... Toxicity testing was performed on all root fragments after washing them three times in distilled water, and after filtration, 10 microliters of each thrid wash sample was incubated with six enzymes (i.e., phosphorylase kinase, phosphortyase A, pyruvate kinase, phosphoglycerate kinase, creatine kinase, and adenylate kinase) to determine the degree of enzymatic inhbition." Results: The percent of enzymatic inhibition ranged from 28% to 89%, with a median of 68%. 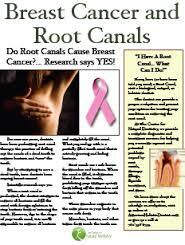 DENTAL PATHOGENS "EMBED IN VARIOUS BODILY TISSUES"
SO, ARE ROOT CANALS AND DISEASED TEETH ON THE BREAST MERIDIAN? CONNECTION TO THE 4th AND 5th TOOTH FROM CENTER TOOTH, RIGHT AND LEFT, UPPER AND LOWER JAW. Burton Goldberg wrote, "Each tooth relates to an acupuncture meridian, Dr. Rau explains. This means a problem in a tooth can focus its energy imbalance elsewhere in the body, in this case his patients’ breasts."http://www.burtongoldberg.com/page79.html.) Further, Burton Goldberg wrote, "Dr. Rau has created a dental chart that maps out the precise relationship between teeth, meridians, and illnesses, including cancer. The breast, for example, lies on the stomach meridian. This means that if you have a problem (such as a root canal or jaw infection) in or around the teeth situated on this meridian, said problem can block the flow of energy along the pathway of the stomach meridian, causing degeneration and eventually cancer. Like Dr. Issels before him, Dr. Rau has also found that such dental factors can also be involved in the development of other cancer." http://www.burtongoldberg.com/page79.html. THE LATE WONDERFUL DENTIST, DR. HAL HUGGINS, REMINDED US THAT TAKING OUT AN AMALGAM AND FILLING IT WITH PLASTIC COMPOSITE MATERIAL, MAY NOT BE A "WHITE KNIGHT". INSTEAD, THE COMPOSITE FILLINGS ALSO HAVE CHEMICALS THAT CAN LEACH, AND MAY CONTAIN ALUMINIUM TO MAKE THE COMPOSITE MORE VISIBLE ON AN X-RAY. SO, YOU DECIDE TO REPLACE YOUR TEETH METAL (AMALGAMS, GOLD, ETC.) WITH COMPOSITES? ANY HARM IN COMPOSITES? ESTROGENIC? "I do not, for instance, recommend that .. teeth be removed from a healthy person. But I believe if they are diseased, they cause the body's natural resistance to be lowered, thus acting as an important contributory factor to tumor development. In these cases, I insist on their removal." CHEMICALS MAY SEEP OUT INTO THE BODY. Cavitations pose another problem that need to be addressed. Cavitations are holes in the jawbone from extracted teeth that have ostensibly been healed. Typically, there may be cavitations at wisdom tooth extraction sites. Periodontitis, an infection of the tooth gums, is yet another problem. The bacteria may robustly promote heart disease.But what about breast cancer? 1. 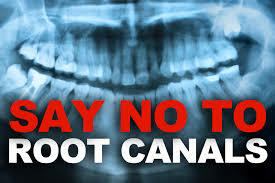 "Remove root canal-treated teeth. 2. Have your dentist check for any other non-viable or infected teeth and decide if enough evidence supports monitoring a suspected tooth or extracting it. 4. Address existing gum disease and practice." TOOTH BRUSHING: "Tooth brushing should be done at least twice daily, once in the morning, and then right before bed. An electric soft toothbrush is recommended." FLOSSING: "Flossing is recommended to manually debride the sides of the toothe and the interproximal gingival sulcus where tooth brushing does not reach. Flossing once daily at bedtime with thin unwaxed dental floss is a good routine. ORAL WATER IRRIGATION: Oral water irrigation, known to many as the Waterpik, is esssential for restoring and maintaining gum health." Robert Kulacz, DDS, and Thomas Levy, MD, JD., 2014. In the Tomar P et al. 2014 review article, the researchers stated, "The concept of oil pulling really isn't new, but it is a modified version of oil gargling... Oil pulling has been used extensively as a traditional Indian folk remedy for years to prevent decay, bleeding gums, oral malodor, dryness of throat, cracked lips, and for strengthening teeth, gums, and jaws." "It's really amazing what oil pulling can do. It's excellent as a preventative and it can even help treat some conditions.. Now, the first thing that people experience when they start oil pulling is the improvement they see in their oral health. Things like how their teeth become whiter. Bleeding gums stop bleeding. The gums around the teeth that may be loose may tighten up around the teeth. The color of the gums would improve because it removes inflammation. Bad bread, it gets rid of bad breath, which is primarily caused by bacteria in the mouth. It helps clean off coatings on the tongue, and can even help get rid of tartar and things like that. In fact, even in infections that can be in the mouth, it will draw the infection out, so even in the abscessed tooth, now there's different degrees of severity, and so if a tooth is too far gone, there's not much you can do with it, but even some deep-seated infections can be reversed with daily oil pulling." Bruce Fife, ND., 2014. ​ Coconut Oil: "Coconut oil is commonly used for oil pulling. "What make coconut oil different from most other dietary oils are the basic building blocks, or fatty acids, making up the oil. The predominant composition of coconut oil is a medium chain fatty acid, whereas the majority of common edible fats in our diet are composed almost entirely of long chain fatty acids. This influences the physical and chemical properties of the oil. Coconut oil contains 92% saturated acids, approximately 50% of which is lauric acid. Recently, results from many studies revealed that the monolaurin, the monoglycerides of lauric acid from coconut oil had antimicrobial activity against various Gram-positive and Gram-negative organisms, including Escherichia vulneris, Enterobacter spp., Helicobacter pylori, Staphylococcus aureus, Candida spp., including Candida albicans, Candida glabrata, Candida tropicali, Candida parapsilosis, Candida stellatoidea, and Candida krusei, as well as enveloped viruses through the exact antibacterial mechanism of the action of coconut oil is still unclear, it was hypothesized that monolaurin and other medium-chain monoglycerides had the capacity to alter bacterial cell wall, penetrate and disrupt cell membranes, inhibit enzymes involved in energy production and nutrient transfer, leading to the death of the bacteria"
Sesame Oil: "Sesame oil is a very old cultivated crop and thought to have originated in Africa. Chlorosesamone obtained from roots of sesame has antifungal activity. Sesame lignans have antioxidant and health promoting activities. high amounts of both sesamin and sesamolin have been identified in sesame. Both sesamin and sesamolin were reported to increase both the hepatic mitochondrial and the peroxisomal fatty acid oxidation rate. Sesame seed consumption appears to increase plasma gamma tocopherol and enhanced vitamin E activity which is believed to prevent cancer and heart disease. Sesame oil is found to be effective in reducing bacterial growth and adhesion. Toxins and bacteria from the body might be expelled through the tongue and trapped in the oil and removed from the body. Sesame oil was demonstrated to have antibacterial activity against Streptococcus mutans. It contains high amounts of unsaturated fatty acids. Linolenic acid and other oleic acid are the predominant compositions. Oil pulling therapy with sesame oil significantly reduced S mutans counts in plaque and saliva of adolescents within 1 week." ​"1. Make sure to oil pull first thing in the morning right after you get out of bed, before you brush your teeth or drink anything. 3. Spit the oil in the trash (not the sink so it doesn't clog up the plumbing... ask me how I know), and immediately rinse your mouth out with warm water (use salt water for added antimicrobial properties). 4. Finally, brush your teeth as normal. 5. Volila, easy as that! SO, HOW DO YOU DO OIL PULLING? WHAT IF YOU HAVE DENTAL FILLINGS, CROWNS? WILL OIL PULLING LOOSEN THEM? Dr. Coconut (Bruce Fife, ND) wrote, "Occasionally, people report that they have lost fillings or crowns when they started oil pulling. Others are hesitant to try oil pulling in fear that it might loosen their dental work. Let me ease your fears. Oil pulling will not and can not loosen properly placed crowns or fillings. The only time oil pulling will affect crowns or fillings is if the teeth underneath have decayed and are full of infection. In this case, the foundation on which the crowns or fillings are secured to is badly decayed and unable to hold the dental material. Oil pulling removes bacteria, pus, and mucus. It can not pull out porcelain, amalgam, or composite dental materials from the mouth. If you have fillings or crowns, you are completely safe. If, however, a filling or crown does come loose, be thankful. This indicates that the underlying tooth is rotting and full of infection. This infection is spreading throughout your mouth and your entire body. You need to have it removed as soon as possible. If oil pulling brought your attention to this problem, you are lucky, because now you know the problem exists and you can take care of it without experiencing further harm." WHY DOES OIL PULLING WORK? Interviewer Jack Miller, CTN, asked Bruce Fife, ND, about why oil pulling works. "...One of the reasons why oil pulling works so well, and why it works better than antiseptic mouthwashes is because it's a fat, and fats attract, and fat and water repel. Any time you do any cooking, you experience how oil floats on top of water and all that. Well, in your mouth, the oil attracts the bacteria, or the bacteria actually attracts to the oil because the membrane surrounding the bacteria is made of fat, fatty acid, and so it just automatically absorbs into the oil, so when you're swishing it around and you're pushing it through your teeth and around your gums, it's kind of like a vacuum cleaner that's just sucking up all this bacteria, as well as the mucus and plaque and other things like that. And when you spit it out, your mouth is going to be much cleaner." Interviewer Jack Miller then asked if oil pulling helps to give the good flora a chance to repopulate. "Basically, what oil pulling is, is putting some oil in your mouth and swishing it around, as as you do that, the oil attracts and pulls out bacteria, viruses, fungi, mucus, plaque, toxins, and then when you spit it out, you're removing those toxins, those bacteria and such from your mouth, making your mouth cleaner and healthier. Now lots of people tend to think that their mouth is separated from the body, but what goes on in your mouth really, you know, affects the entire body. And so the bacteria in your mouth not only can cause cavities and gum disease, but bacteria can seep into the blood stream and circulate through the body, and it often affects different parts of the body. The bacteria can go to your heart, or to your liver, or into your kidneys, or to your joints, or to your brain. And when it goes to these areas of the body, it can cause different types of health problems such as going to your joints, it can lead to arthritis. If the bacteria goes to your brain, it can lead to dementia, if it goes to you heart, it could lead to heart failure. And so, bacteria in your mouth can actually promote a wide variety of disease or health problems throughout the body. And, for the example, the bacteria in your mouth can go to the heart. In fact, when you go to the dentist, and if you've had any heart condition, the dentist will prescribe antibiotics for you because he knows that as he works on your mouth, he's going to release more bacteria into your system, and that bacteria can go to the heart and cause heart failure. Also, the bacteria can go to your brain and cause dementia, and it's interesting the reason on this is that they will take bacteria from people who have died from dementia, and analyze it, they'll do DNA testing, and they will find that it's the exact same bacteria that is in the patient's mouth, so they know for sure where the bacteria came from. You know, more studies are being done. 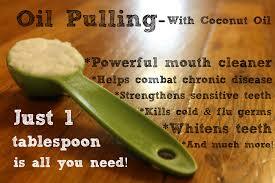 A couple of more studies regarding oil pulling have been done. One that I actually mentioned where a professor of dentistry in Canada who tried oil pulling as a means to treat the Sjogren's disease which is a disease which causes a dryness, a dry eyes and dry mouth, and she found that it helps stimulate the flow of fluids to help with that condition, and in her study, she also found that it was very effective in reducing the bacterial count in the mouth. So this is just more evidence that oil pulling really does work in reducing the bacterial load in the mouth, and it's not just studies coming from India, but also from Canada and elsewhere." ​COCONUT OIL VERSUS MOUTHWASH (CHLORHEXIDINE) IN PLAQUE AND GINGIVITIS IN ORAL HEALTH - WHICH IS BETTER? The same!... According to the Peedikavil FC et al. 2015 study. The chlorhexidine-containing mouthwash and coconut oil pulling have comparable results upon plaque formation and plaque-related gingivitis. Background: Coconut oil's medium chain fatty acids, as opposed to long chain fatty acids, have an influence on coconut oil's biochemistry. "Coconut oil contains 92% saturated acids, approximately 50% of which is lauric acid. Human breast milk is the only other naturally occurring substance with such a high concentration of lauric acid. Lauric acid has proven anti-inflammatory effects and antimicrobial effects." In the Peedikavil FC et al. study, "60 age matched adolescent boys and girls in the age-group of 16-18 years with plaque induced gingivitis were included in the study and oil pulling was included in their oral hygiene routine. The study period was 30 days. Plaque and gingival indices of the subjects were assessed at baseline days 1,7,15 and 30." Results: "A statistically significant decrease in the plaque and gingival indices was noticed from day 7 and the scores continued to decrease during the period of study." How does it work? "In oil pulling, as the oil is swished in the mouth, the mechanical shear forces exerted on the oil leads to its emulsification and the surface area of the oil is greatly increased. The oil film thus formed on the surface of the teeth and the gingiva can reduce plaque adhesion and bacterial co- aggregation. It was also proposed that the alkalis in the saliva can react with the oil leading to saponification and formation of a soap like substance which can reduce the adhesion of plaque. Coconut oil has a high saponification value and is one of the most commonly used oil in making soaps." We all naturally remineralize our teeth via minerals in saliva and food. Losing minerals - such as calcium and phosphate - can lead to decay. In the Arany P et al. 2014 study, the researchers studied the effects of low power laser therapy on dentin teeth repair. ​ Basically, these researchers were able to employ just a low power laser to trigger dental stem cells to form dentin. Importantly, dentin is the "bone-like structure under your teeth's enamel". How does the low power laser work? The laser creates ROS, which activates transforming growth factor beta-1(TGF-B1), which then directs dental stem cells differentiation for regeneration. "Laser-activated TGF-β1 was capable of differentiating human dental stem cells in vitro. Further, an in vivo pulp capping model in rat teeth demonstrated significant increase in dentin regeneration after low power laser therapy treatment." Conclusion:. "The ability of low power laser therapy to activate an endogenous morphogen to direct resident stem cell differentiation—in this case, dental stem cell—adds a new, potent tool to the regenerative armamentarium. This study elucidated both the efficacy and the primary mechanistic role of low power laser therapy and ROS–TGF-β1 in mediating dentin regeneration. .... Given the broad range of roles that ROS and TGF-β can mediate in vivo and the popularity of laser devices in current clinical settings, the mechanistic insights from this study could also promote clinical translation of low power laser treatments to modulate pain, inflammation, or immune responses, and promote tissues regeneration of bone, neural, vascular, and muscle tissues." PLEASE SEEK A COMPETENT BIOLOGICAL DENTIST TO EVALUATE YOUR DENTAL PROBLEMS AND REMEDIES.